As one of the most important safety features on your vehicle, it’s crucial that you keep your car brakes well maintained and stay on top of any repairs. 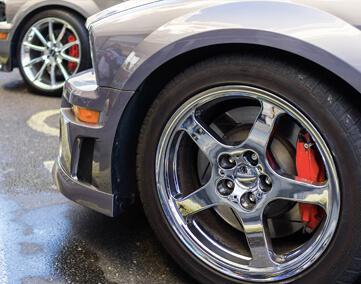 At Precision Auto in Germantown, MD, our expert ASE Certified Technicians specialize in brake service and brake repair. Our auto repair center is fully equipped with the best diagnostic and maintenance tools for brake service in Germantown, so whether you’re having an issue with your brakes or just want to keep up with their maintenance, bring your car to “A Family You Can Trust!” Precision Auto recommends bringing your car in for brake service as soon as you notice any signs of malfunctioning brakes. The warning signs that your brakes need attention are usually audible. Drivers should occasionally drive with their windows down so they can hear the condition of their brakes. A high-pitched squeal is an early sign that your brake pads are wearing down too low. The braking system is built with an early alert to notify you when to visit our shop. Owners should not delay brake service because there will be a metal-on-metal grinding eventually. This is an emergency that should be brought to Precision Auto immediately. Towing may even be necessary to prevent extensive damages to your braking system. Drum brake systems slow/stop a vehicle using hydraulic pressure to generate friction. This is caused by a set of brake shoes that press against a rotating drum-shaped brake. These types of brakes are found on the rear axles of low performance vehicles and large trucks. As the most commonly used brake systems on vehicles today, disc brakes are typically located on the front wheels. They work by brake pads on either side of the brake rotor tightening when pressure is applied, resulting in friction that slows the wheel down and to a complete stop.